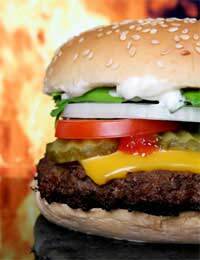 Home > Types of Fast Food > How Healthy Are Burgers from Fast Food Outlets? We all enjoy a burger occasionally - and they can be tempting when you're on the run and hungry. But are the stories about burgers and the things that go into them true? And what are the healthy choices on a burger menu? Why Are Burgers Considered To Be Unhealthy? The main concerns about burgers are that they are high in saturated fat, salt and some of the larger options also give you a pretty hefty hit of calories in one go, especially if you combine the burger with cheese, bacon and fries. For example, a well known burger chain advertises the nutritional content of a double cheeseburger as having 12g saturated fat, 2.2g salt and 440 calories. Put into context, you’re taking in a third of your daily salt intake, well over half of your saturated fat for the day, and depending on whether you’re male or female, over 25% of your daily calories! And that’s before you add a side order of fries or a fizzy drink. There are options on a burger bar take away menu that could prove to be more healthy for you than a double cheeseburger and salty fries, but you have to look carefully. Most burger chains now print their nutritional information on leaflets available in the store, and you’ll certainly be able to find them online too. A fast food burger occasionally doesn’t make your diet unhealthy, but if you partake more regularly in fast food from burger bars, you might find that your waistline expands and you’re not doing your health any good. If you’re looking for a slightly healthier fast food option than a straight forward beef burger, you could try asking for a chicken burger instead – but some outlets are very heavy handed with mayonnaise and additional dressings and you could find that what originally sounded like the healthy option turns out to be a bad move. The chicken option is usually lower in saturated fat if the rest of the burger isn’t swamped in a high calorie dressing. The same applies to the vegetarian options, in one outlet the veggie burger is higher in calories and fat than the chicken sandwich so beware – vegetarian selections are often quite high in calories, although the saturated fat drops right down for a veggie option. Is There Anything Good About Fast Food Burgers? Well, all food has good points even burgers, and one thing about a fast food beef burger is that in most cases they are now advertised as being made with simply ground beef, and a little seasoning. Most big outlets are only too aware of the negative publicity around their food and are trying to improve standards and nutrition. A beef burger contains iron and protein, both essential for nutrition, and if you opt for a better quality menu choice (one chain recently introduced a ‘higher quality’ beef burger designed to appeal to people who enjoy decent quality burgers but are still in a hurry) you could have a reasonable meal.